1:15 - How do I get a workout partner to have the same drive as me to achieve what I want to? 5:10 – How do I know I’m pushing hard enough during my workouts and also sufficiently recovering? 9:30 – Can you do hypertrophy workouts to gain mass while still training for strength? 13:30 – How would you program a week of training for a fighter in camp? 17:15 – How are you able ... See More to put on so much mass without getting fat? 21:00 – Have you ever considered laying off the fast food and getting in more plants? 23:40 – What is the most important training variable when it comes to training with very little time? 26:00 – Can you talk about the importance of sleep in a recovery regimen? 29:00 – I think I’m possibly going to lose my hair. Did you struggle with baldness? 31:15 – How do you get your partner into fitness? 35:30 – What helps you stay present? 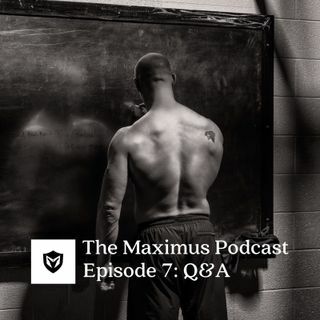 39:45 – What are your thoughts on building strength technique on Oly lifts before starting the Maximus Body? 47:45 – What exactly is Blender Bottle? 49:30 – If you had to sacrifice sleep, recovery, or nutrition which would you pick? 52:45 – What is the most patties you’ve ever had on a hamburger? 53:30 – What do you do when one of your superiors hates you because he envies you?